The SKB 3I-2011-MC12 iSeries Case for 12-Mics & Cables is a microphone case that holds 12 microphones stored vertically and is part of the iSeries waterproof case line. The microphone holes are designed to secure popular types of handheld microphones, finger cutouts that provide instant access, and a generous storage compartment for cables and microphone clips. The interior is made of high quality PE foam. The 3I-2011-MC12 Microphone Case measures 20.00 x 11.00 x 8.00” deep. It is constructed of high-strength polypropylene copolymer resin and features a gasketed, waterproof, airtight, and submersible design (IP67 rated) that is resistant to corrosion and impact damage. Its continuous molded-in hinge, patented trigger-release latch system, comfortable, snap-down rubber over-molded cushion grip handle, secure stacking, and automatic ambient pressure equalization valve (MIL-STD-648C) all contribute to its military-grade design. 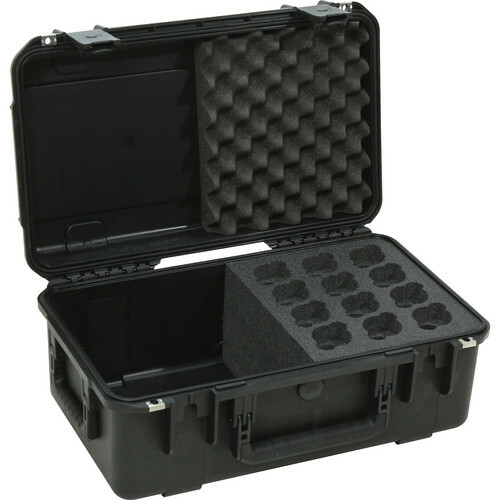 Box Dimensions (LxWxH) 22.0 x 14.6 x 9.4"
3I-2011-MC12 iSeries Case for 12-Mics & Cables is rated 4.9 out of 5 by 8. Rated 5 out of 5 by Gary Olson from A Very Useful Case You have a small pencil mic? No problem. Toss it in and you're good to go. Got a bigger mic? Give the top foam insert of your slot a yank and it pulls right out to make more room for your mic. Still not big enough? Yank the 2nd insert out which is located under the first. Now your slot is spacious all the way down to the bottom - where they've placed another layer of foam between your precious mic and the plastic case. By the way, these inserts are two different sizes, so you can customize the lots more. This is a solid, light weight (before filling it) which is great to use. A no brainer in my book. Rated 4 out of 5 by Ottman from Sturdy bit not as roomy as claimed Very strong and sturdy case. Great for storing and travelling with a lot of microphones. However, the space provided for cables and accessories is not as large as I had hoped. There is no way you can get 12 XLR cables in there, along with 12 mic stands. I managed to get 6 cables and stands to fit tightly. 12 mics yes, 12 essential accessories - no. Rated 5 out of 5 by Marctbo from Excellent case for mics, cables and more... This case is awsome! Very sturdy with heavy duty hinged claps to lock! It's much bigger than I expected! Besides storing 12 mics safely, there's extra room for cables, mic clips and other accessories. I love it! I recommend this case to everyone for your mics and accessories!! Rated 5 out of 5 by Vintage.Picker from I'm very happy with this product I purchased this microphone case to replace a bunch of smaller boxes and to help organize and speed up set up and take down at shows. It is well built and provides great protection for the mics and has room for a couple direct boxes and enough cables for the setup. Rated 5 out of 5 by Lister Sal from Great gear!!!! This product is used to protect our expensive microphone, It is lightweight yet strong and easy to carry. We love the gear!!!!!! How would this work with large-diaphragm condenser mics, like a Rode NT2A? It would not fit or slide all the way down in the foam part. I have a similar microphone and I keep it in a seperate case that it came in. This case is mostly for mics like SM-58, SM-57 or similar small tubular mics like that. What is at the bottom of each mic slot? Would it safely secure small diaphragm mics? I bought 2 of these about 6 weeks ago and use them for shows a few times a week, love it! I can't remember for sure but I believe there is a bit of foam at the bottom of it. I've been playing for a living for about 15 years and use/ have had many cases. I place 12 various mics, small diaphragm condensers, 58s, 57s, Senh 835s, 935s and a wireless which I unscrew in 2 pieces. Other side holds I'd say about 20+ 25' cables. 1 is perfect for average 4-5 piece club band. As a drummer I keep Tom and Kick mics in a couple separate mic bags and keep them on the cables side. Simply a perfect mic / cable case for most of us. If there were a more deluxe version only thing they could maybe add is 2 very small wheels and a slightly augmented (possibly telescopic) handle to tow. Could easily be argued that it would add more weight/size which in my world is always a negative unless done very slick. I wish more cases were built like this in this price range, would make an average musician's life easier!